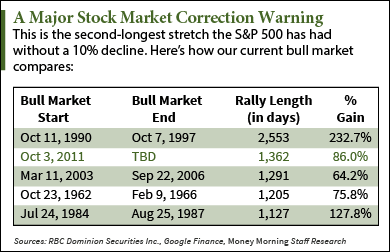 This is the second-longest stretch without a stock market correction for the S&P 500 since 1945, according to RBC Wealth Management. It's been more than 1,350 days since we've seen a correction in the S&P 500. A stock market correction is defined as a 10% dip from the index's high. Since Oct. 3, 2011, the S&P 500 has gained 86%. That's still a far cry from the rally of the 1990s, which saw the index climb more than 232%. 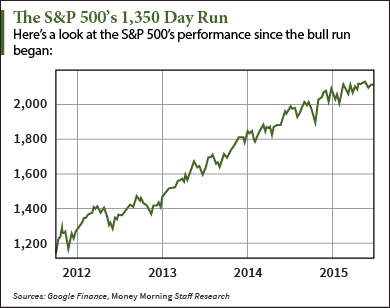 The closest we've come was when the S&P 500 dipped 7.4% from September 2014 to October 2014. This extended run has many analysts predicting a stock market correction. "This summer we see a high chance of a 5-9% dip as we think uncertainty on Fed actions in the face of a tightening labor market could cause yields to climb higher and we think Greece risk amidst ECB commitments to high liquidity pushes the Euro lower," Deutsche Bank analysts wrote earlier this month. Are Stock Market Correction Fears Justified? "I think we're looking at a grinding, sideways bull market through the summer into the fall," Barton said on his regular CNBC appearance. "We're not going to get a lot of upward movement. Therefore, if you're putting money to work, you're going to want to put it in sectors that are doing the best." One field to target is healthcare. It has been strong all year and rallied this week following the Supreme Court's Obamacare ruling. The Nasdaq Health Care Index (Nasdaq: IXHC) is up 17% in 2015. And even though a stock market correction is long overdue, this is not the time to flee the markets. "I think you definitely have to be concerned that every time we've gone up in the last four months, and even when we've made new highs, it has been just a marginal, tiny new high," Barton continued. "One of the problems technical analysts look at is that every time we've made a new high over the past six weeks, it's been with less and less broad participation." "It's a concern, but it's still not time to jump off the boat. Especially when we're trading right at the top of the page. Even as a technical trader, I say let's continue to put money to work on pull backs." The more I read about the impending correction the more my nerves get to me. As a soon-to-be retiree, I am so worried that something significant could derail my plans. Thanks for the information. It confirms much I what I have believed so far. I have also been keeping track of where we are using this neat tool a friend showed me at http://www.marketdip.com. It shows real-time data on market corrections.